How did this session come about? As part of the bank wide ‘Customers In Vulnerable Situations Programme’, a day of training was organised for staff across the country. Increasing knowledge of dementia was an important part of this, and as a Champion, I was asked to run a Session where we made 40 new Dementia Friends. Also our L&D Leadership team has asked me this year to run Sessions in each of our nationwide hubs for HR teams. I have received great support and attendance has been good so far. What actions came from the Session? Besides a host of individual actions, we voted for a minimum top 5 things that could enhance customer experience for customers living with dementia. How do you think Dementia Friends can impact working environments? It can have a hugely positive effect in terms of building support and understanding for both customers and staff (or their carers) living with dementia. As well as a number of volunteer Dementia Friends Champions running sessions like myself, there are a number of formal things the business has been doing, to improve the experience for our customers living with dementia. 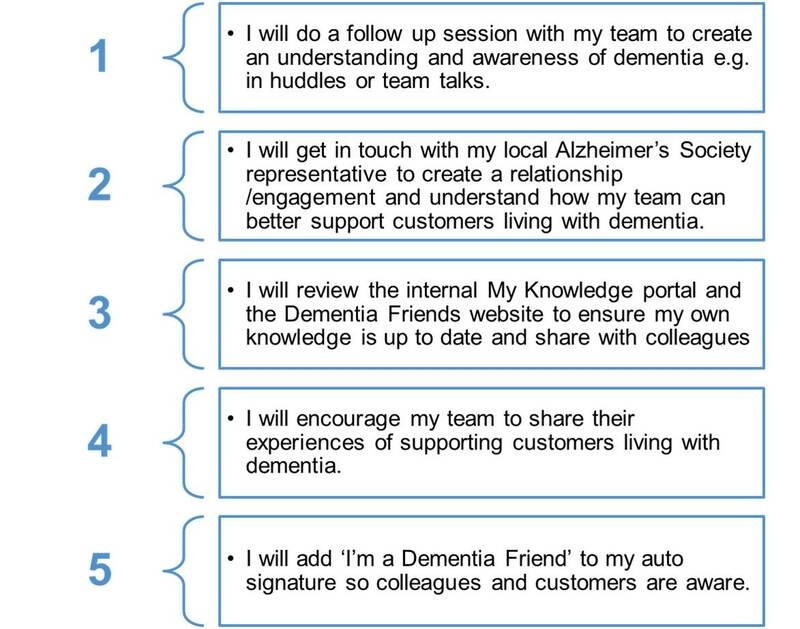 RBS signed up to the Dementia Friendly Financial Services Charter in 2015, sponsored the International Dementia Conference, encouraged colleagues to become a Dementia Friend and agreed 5 key commitments with the Alzheimer’s Society to support customers living with dementia. To help provide support for customers living with dementia, an online Dementia Hub is being launched for staff, and enhanced processes and brochures. Did you face any challenges while organising or delivering this session? With 45 participants the challenge is to keep to time whilst ensuring the session remains interactive and engaging. So I used the slides, with participants sitting at tables, with microphones to hear their views and frequently walking the room. Putting the bingo cards/action mailers on tables in advance helps save time. Any tips to fellow Champions, organising sessions at their workplace? Word of Mouth – Participants can become advocates and spread the word among colleagues or internal networking tools. You can always get in touch with your RSO, or check out these webinars for Dementia Friends Champions to get some more tips or help in running your Sessions. Iain is such a dedicated and passionate volunteer Dementia Friends Champion. His efforts in rolling out Dementia Friends at RBS have had such a huge impact in terms of both awareness raising and supporting people living with dementia to live well. Iain won an ‘outstanding contribution’ award for his efforts at RBS and was able to donate £100 to Alzheimer’s Society as a result. Thank you so much Iain – you are an inspiration!